Andrew Alexander has only been a UFV alumnus for four years, but he’s accomplished enough in that short period to earn him the Young Distinguished Alumni Award for 2018. After finishing his Bachelor of Science (Honours) with minors in biology and chemistry in 2014, he headed into a master’s degree program in molecular biology and biochemistry at the University of British Columbia, and then was invited to transition straight into a PhD program, where he continues his research. He has completed all the coursework for his doctorate with an A+ average. An enthusiasm for scientific research sparked during his time as an undergraduate student at UFV inspired him to choose research-focused graduate studies over his original goal: veterinary school to follow in his father’s footsteps. In his current research, he uses X-ray crystallography to study the molecular basis for antibiotic resistance in bacteria, exploring and characterizing proteins involved in peptidoglycan biogenesis and antibiotic resistance. He plans to continue his PhD studies for a few more years, then conduct post-doctoral research with hopes of landing a permanent academic position. Since 2016, Alexander has held a prestigious Vanier graduate scholarship, funded by the Canadian Institute of Health Research, worth $50,000 per year. He declined three other doctoral scholarships due to winning the Vanier, and also received the $17,500 Alexander Graham Bell graduate scholarship funded by the Natural Sciences and Engineering Research Council of Canada in 2014. While at UFV he earned Dean of Science Medal of Excellence as the top graduating science student. 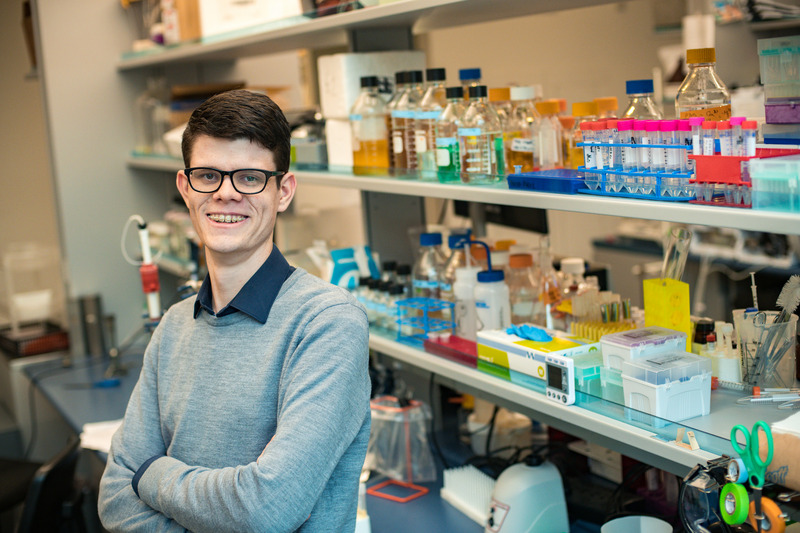 Alexander spends his days and many nights working in the structural biology lab run by Dr. Natalie Strynadka at UBC, but also makes time to contribute to his community. He is a member of Green College, a residence at UBC that encourages interdisciplinary interaction and public outreach. His contributions have included serving on the academic committee, organizing talks, co-chairing lecture series, acting in a play, and presenting his own lectures, which make his scientific research understandable to a lay audience. He is also a member of the editorial board for the Centre for Blood Research magazine and has contributed several articles to the publication. And he serves as a mentor to undergraduate students, which he started doing while still a UFV student. Alexander was homeschooled before starting at UFV in 2010. He credits his time at UFV for setting him on the path to a research career, particularly for the extracurricular research experience he was able to get as an undergraduate. He started in chemistry professor David Fenske’s lab in lipid biochemistry lab in winter 2013, and then spent two summers working in the lab of Dean of Science Lucy Lee, studying how toxicants affect fish cell lines. In his final year his honours project with biology professor Steven Thomas focused on using bacteria for soil remediation after oil spills. He also credits Dr. Lee for pushing him to the next level by encouraging him to apply for the NSERC graduate scholarship that set him on his current academic and research path. Lee was mightily impressed by Alexander when he was an undergrad at UFV. Although his initial reaction to being named the UFV Young Distinguished Alumni for 2018 was shock, he is also delighted to be invited back to UFV for the ceremony at UFV’s annual Town and Gown event. He is also returning for a Faculty of Science graduation school information night. “It’s nice to feel connected to UFV,” he says.